John Mattson is an architectural engineer, adventure writer, and photographer who has spent most of his life enjoying the great outdoor adventures that our incredible planet provides. He is an expert kayaker, skier, climber, and a defender of Mother Earth. 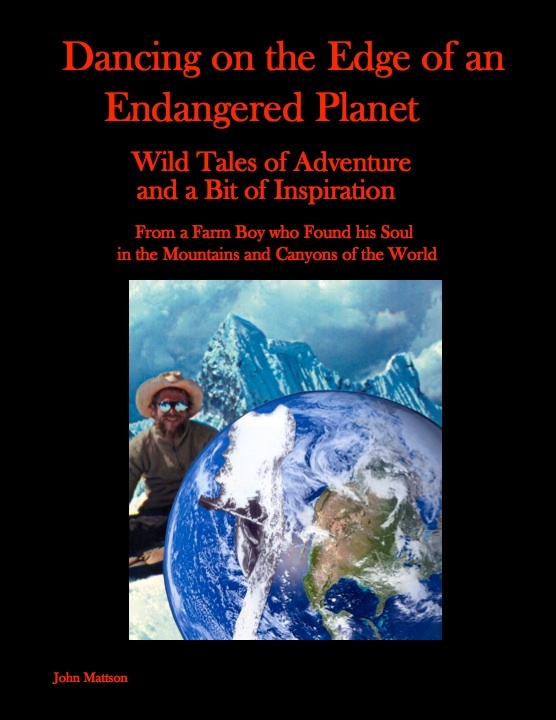 He has recently self-published a thrilling and colorfully photographed book of 26 diverse and extreme adventure stories. It is entitled "Dancing on the Edge of an Endangered Planet." danceonedge.com. This book took first place in the 2010 CIPA book awards for the legacy category. Mount Toll from Blue Lake The ski run is on the left skyline. 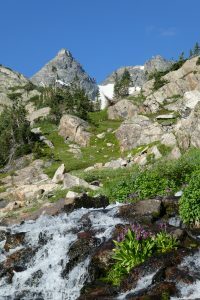 Mt Toll is a spectacular peak that towers above the awesome vistas of Blue Lake, in the Indian Peaks wilderness of Colorado, and its somewhat moderate slopes provide one of the best ski descents on the Colorado front range. This peak has become my right of spring passage for quite a few years, and I don’t feel like I’m ready for summer without it. The steepest mandatory skiing is about 35 degrees and on an open slope so I cautiously wait for stable spring conditions. This normally occurs in mid May and if the planets align properly, it is possible to ski from the Mitchel lake trail head after an easy 3 mile bicycle approach (The main road usually doesn’t open till late June, but it is usually passable a lot earlier and I find a bicycle a lot better than trudging on the asphalt road). But 2018 was a bad year for planet alignment in many aspects, and one of them was a closure to all humans on the only access road until late June. This combined with global warming and a low snowpack left a very dismal setting for my annual pilgrimage. But the road finally opened, and I was in dire need of a ski adventure, so I packed my skis and headed out from the Blue Lake trail head at dawn. It was another perfect day in the high Rockies and my spirit soared as I headed out on the empty trail. The throngs of tourists would be arriving soon, but now the wilderness is almost void of humans and I share the trail with only a couple of deer and a few birds. The air is crisp and clear and I pause for a few moments to smell the air and hug one of the ancient Spruce trees that has been here so much longer than me. The sun begins to show its face on the high peaks and I’m thrilled, but also somewhat shocked to see the diminished size of the old snow field. It does look skiable and somewhat inviting, but my normal line is dry and the only remaining snow is on the steep south-east facing coular. The trail that I normally climb is also very dry, and I don’t find any snow till I am above the brilliant vistas of Blue Lake. The bright Colorado sun has finally surfaced out of the eastern horizon and it soaks my old body with warmth as I stop to change into my heavy ski boots. 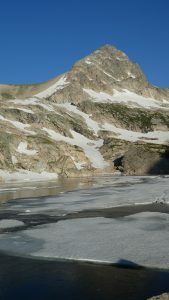 The snow has already evolved into a summer glacier like snow pack, so I leave my skis on my pack and kick steps in the partially frozen snow.The slope gradually steepens and the high altitude air is thin, so I stop for a few moments to catch my breathe and ponder the vastness of this great wilderness. The few early morning hikers have been left far behind, and I am now the only human soul in this grand valley. The only remaining snow is close to 50 degrees in steepness and somewhat variable in texture so I’m not sure that I want to ski it alone, but it does provides a thrilling snow climb and I somewhat foolishly opt to go for the summit. The steep frozen snow nearly reaches the top, but some of it is really icy and very steep so I decide not to ski the steepest part. But, reaching the summit requires scrambling on talus with ski boots and an awkward pack which proves to probably be quite a bit more dangerous than the steep coular. I suddenly wish that I had left my skis at a bit lower spot, but hindsight is always 20 20, and plan B doesn’t seem too terrifying, as I finally reach the top of this awesome peak. The summit is calm and sunny, but a very friendly marmot is determined to share my lunch and it takes an aggressive defense of small pebble throwing to partially deter him. This peak is not often climbed and he is really determined to befriend me. The barrage of small rocks eventually succeeds, but he retreats only a few feet and continues to watch me. The joyful summit is hard to leave, but the thrill of skiing, and the fear of the somewhat ominous task that awaits me makes it very hard to truly relax. Scrambling down loose talus in my ski boots and awkward pack proves to be as challenging as I had anticipated, and I suddenly wish that I had just gone for the steep slope, but this annoying obstacle is eventually accomplished. The friendly marmot seems to be concerned for my safely or else extremely hungry and lonely so he follows me back to where I finally start skiing. The slope is still quite steep and the transition to skis is a bit challenging, but the frozen snow has softened a bit with the early morning sun and provides a joyous descent that makes the scary talus just seem like a bad memory. The east face has become a bit runneled from the sun and recent rock fall, but the warmth of the morning sun makes it somewhat reasonable. This mountain has become a popular ski run, but I am the first person to ski it this year so I try my best to carve my ski signature on the virgin slope. The exposure on the lower slope faces north and is in almost perfect condition, so I carve a set of perfectly symmetrical turns that will only last a few hours. But, I can’t help but stop to admire them as I remove my skis and prepare for the tourist filled trail. I awake way before dawn after a somewhat restless night, and start to prepare for the new days event. The plan is very exciting, but I am also a bit apprehensive about this somewhat serious adventure. The route that I am planning to climb involves a fairly long approach, some steep snow climbing, and a somewhat challenging class 3+ chimney on a remote mountain face. I’ve climbed this route twice before, so I know what I’m getting into, but I’ve aged a bit since the last attempt, and I know that it deserves respect. I had made a feeble attempt about a week ago, but a sixth sense and less than perfect weather caused me to turn back early. The alternative was finding shelter from the harsh wind, and spending a lazy day in an awesome and very secluded high alpine meadow. But, today feels very different, and I’m anxious to finish the challenge. The weather looks good, and so are my energy and spirits, as I park my van at the trailhead. A note stating, “Climbing west Chimney of Navajo. Back by mid afternoon.” is left in a conspicuous location on my dash, and I’m on my way. The dawn of the new day is just starting to brighten the sky as I saunter briskly along the well worn trail to Isabelle lake. The trail is lined with some very large Ingleman Spruce trees that are much older than me and a pair of young bucks are grazing in an adjacent meadow. The first rays of the sun light up the high peaks as Navajo and Apache come into view, and my soul is suddenly invigorated. A couple of early morning photographers and a young moose great me as I reach the stunning vista of Isabelle lake. But here the main trail ends, as I leave the soon to be very busy valley and wander alone into the high alpine zone. The trail has suddenly disappeared, but I know this valley well, and a maze of grassy ledges and tiny valleys provide for a fairly easy scramble. My awareness suddenly kicks in to my extreme mode, because I am aware that even a short stumble might result in an injury that could be fatal in this remote place. I am carrying reasonable survival gear and a loud whistle, but the chance of being found rapidly on this remote mountain face are still slim, so I must be extra cautious. But this caution forces a mental attitude that is totally focused and very enjoyable. All the cares of the world suddenly disappear as I wander upwards completely focused on the task at hand. The air is a bit brisk, but the sun is warm, and the views are brilliant. The soft tundra is bursting with tiny plants that only have a few months to live, and the banks of some tiny rivers are adorned with a myriad of colorful wild flowers. The quickly receding old glacier has left about a hundred new yards of manky scree that involves a frustrating mixture of scrambling and sliding backwards, but I manage to find a reasonable route to the snow, and arrive a bit out of breath. My energy quickly recovers, as I stop for a quick snack and attach my crampons. The next 500 or so vertical feet involves kicking steps in some fairly firm and somewhat steep (40-45 degree) snow. This is actually about the easiest way to climb a mountain if you have the right skills and equipment, and I do. I have come prepared with one medium length ice axe, and a “Whipit” (ski pole with a small ice axe), and crampons. The steep snow is much easier than the loose rock and allows for a rapid ascent, but kicking steps is quite strenuous, so I stop a few times to catch my breath and ponder this awesome paradise. The rhythm of setting a fast pace seems to be more efficient, so I divide the slope into about 5 segments of sprint and rest, and each phase brings me ever closer to the summit. The cool air feels fresh in my lungs and the blood rushing through my brain clears my mind as the last sprint brings me to the top of the snow. Here, the means of travel will change again and I stop on a comfortable ledge and enjoy the last rays of the sun as I remove my crampons and pack away the ice axes. 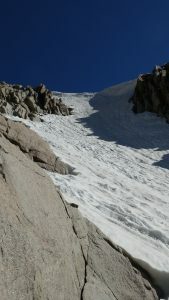 The rest spot is warm and sunny, but the weather suddenly changes as I wander upward onto the shady west face. A brisk breeze is howling through the steep saddle between Navajo and Dicker’s Peck (A small one pitch 5.4 spire that was named by the first ascent party). The usually easy route has been coated with a bit of graupel (frozen rain) from the last thunderstorm. These conditions are not quite what I had expected, but I know the route and don’t wish to turn back now. I am now very aware of my remoteness and the normally 3rd class route is covered with a thin layer of frozen rain. A tiny mistake here, could result in a miserable night or maybe the end of my life, so I proceed very cautiously, and my focus becomes even more intense. The foot holds are a bit slippery, but the hand holds are solid and I revert to the old climbing rule of always having 3 appendages attached while you carefully move the 4th. The approach to the chimney is a bit exposed and I shudder at the thought of being injured on this remote face. But the moves are easy and the exposure mellows as I enter the chimney and move ever upward. This section gets very little sun, and the holds are cold and icy, but I’m starting to catch a rhythm and enjoy a temporary state of nirvana as I climb this stairway to heaven. But the stairway quickly ends, and once more I am faced with a slippery traverse. But the moves are easy, the summit is near, and a sunny ledge is beckoning, so I move cautiously once again. This sunny ledge marks the intersection with the easier “Airplane Gulley” route, and I feel that the climb is almost in the bag, so I decide to drop my pack and take a short break. The rest of the route is still very exposed 3rd class, and a brisk breeze is showing its face, so it is too early to relax. The ledge is warm and comfy, but the summit is beckoning, so I leave my pack, and scramble upward. The route finding here is a bit challenging, and I probably didn’t pick the easiest way, but I manage to arrive on an empty and somewhat breezy summit. This is my favorite Indian Peak, and the views are incredible, but the wind is brisk, and I won’t be able to truly relax till I get back to my pack, so I ponder the views for only a few brief moments. I manage to find an easier route on the return voyage and make it safely back to the comfortable ledge. The ledge is out of the wind, the sun is warm, and the quest is all but finished, so I take a long break in the warm sun and thoroughly enjoy the serenity and great views.